The mesmerizing spinning action of these Kinetic Wind Sculptures is almost hypnotic. Inspired by a rusty old "Sunflower" sprinkler. A gift that surprised me. I enjoy my back yard. It's not that I have anything really elaborate, more a fairly modest garden area, not huge, and certainly not immaculatly tended, but more a collection of ideas and designs collected over a lifetime of living in the one home. Sure things have changed over the years, but some things remain pretty constant, trees, shrubs, concrete areas tend to be pretty permanant, as do some treasured garden ornaments and such, especiially if their origin has a special memory with it. One such item I've had is a rusty old metal sunflower that my daughter drove in the yard with one day, and planted firmly in amongst a bed of ferns we have under some apple trees. 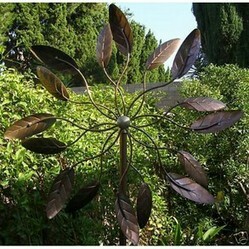 About 6ft tall, it's crafted from metal and a cast iron pipe stand, and has about a 24" "Head" in the shape of a sunflower in bloom. You attach a garden hose to a fitting on the base, and the water travels to the head, where the pressure causes the petals to spin, while showering out of a spinkler in the center. The ferns love the watering, and though it's pretty tarnished and rusty, it suits the decor of our yard, and it does have "memories", as my daughter is long gone and filling her own garden with knick knacks now. I loved the spinning action of the petals on the sprinkler, but found there's only so many times that one is watering the garden, so the opportunity to enjoy it was pretty limited. I could recall that many years ago, whilst on a trip through the South West, my wife and I had stopped at one of those roadside curio shops in Arizona, and they had for sale many models of something a little similar, a garden ornament that was on a stand, in the shape of a flower, and that used wind to power the spinning motion, and obviously well crafted as they seemed to run in the slightest of breezes. Now something like these would be a brilliant addition to the garden, and with the amount of wind we have here, I'm sure I'd see lots of spinning action! Going back to Arizona was out of the question, but surely they were made locally? Time to do a little modern research, and get some ideas from wesites such as Big Granite and maybe even check out what I could find on You Tube. Armed with some information on how Kinetic Wind Sulptures worked and ideas on what models to look for, wifey and I embarked on a mission of checking out all the local garden centers and checking out their garden ornament sessions. Weekend after weekend saw us in different towns locally, but we never did see anything that matched what we'd seen in Arizona. Lot's of either very cheap imitations, or prohibitively expensive models were all we found, which inspired a conversation about our next holiday; maybe it should be back in Arizona, and maybe we should take my pickup truck, buy one there, and simply transport it back ourselves? Thank goodness sensibility set in, as that would have been a very expensive method of buying something that's easilly accessible online! Luckily I found this Big Granite review on a Kinetic Copper Wind Sculpture with it's suggestion of purchasing one through Amazon, and am I ever glad I heeded the advice. You see these are a bit bulky, but having one delivered to your door was a nice touch. It's set up in the ferns now, in full view of the deck. Even though it's been spinning away for months now, I'm still amazed and intrigued how one set of blades spins clockwise, and the other counterclockwise, all at the same time that the wholes assembly spins in a circular motion. Very attractive, very relaxing, mesmerizing even, and a wonderfull addition to the backyard. Right up there with my old sunflower sprinkler! I really like your kinetic sculpture as well as the ones in the video. Those sculptures look so natural, like big flowers. I love ornaments that move!